Hello Traveller Friends I has been some time since we have shared something for our favorite science fiction game. Today we are happy to share with you a little something we’ve been working on. Naturally, it is ships because we love having more ships in Traveller. If I am having a stressful day, designing a ship is always an enjoyable break. With this, we’re trying something new. We’re going to let you name this class of ship. We asked for names over on our Facebook page. The winner will get this the publication this ship first appears in for free. So if you want to submit a name for a future ship, be sure to follow us on Facebook and set the Following level to “See First” so you never miss one of our posts. I would like to thank everyone that submitted off a name. We loved them all, even less-than-serious suggestions of “Jeff” and “Shippie McShipface.” Special shout out to Jeff Zimmerman for pointing out an oversight in the original design (that is fixed above). Click here to see the full size image. There is little I can tell you about this ship that is not already in the image. She is built and used in the Foreven Sector, where all our Traveller supplements take place in. This class of ship is primarily a cargo carrier but expects to see quite a bit of combat; being away from the relative safety of the Imperium means no one is there to swat down pirates. Pirates will think twice when they see the level of armament you bring to bear. Vote in the poll, share it with your friends, and download our supplements for Mongoose Traveller both 1e and 2e today. The ship you fly says quite a bit about the person flying her in the same way that you can tell quite a bit about someone by what kind of car they drive. In the same way you don’t find many young wealthy entrepreneurs driving minivans, you’re not going to find military attack vessels with a large cargo hold. So if you and your gaming group are flying around in the new MDC-41—also known as the Malforge Defense Craft—you’re not going to be your standard group of cargo haulers. This 100-ton ship has exactly 1 ton of cargo space inside. Unlike the civilian variant of this ship, the Malforge Light Cargo Ship (MLCS-783) which has a full 30 tons devoted to cargo. Even though these two ships are identical from the outside (except for the paint job), these two ships are quite different. The attack ship is optimized to jump into a system, conduct its mission and jump back out again, all without refueling. It features a triple beam turret to take on ships that comes its way. While the civilian variant can … deliver cargo. Sure the civilian ship still has the armored bulkheads for the power plant, gravity drive and fuel tanks, and both ships use identical software, allowing the ships to operate with less crew that would otherwise be required. However, it is the way these ships use their space that makes them appeal to very different audiences. So what does choosing the MDC-41 Malforge Defense Craft say about someone that chooses it over the MLCS-783 Malforge Light Cargo Ship? Crews flying the defense craft are looking for action, both in space and on the ground. If you are in the Light Cargo Ship, you are looking for a regular steady job, even if problems keep finding you. Now lets compare the MDC-41 to the Bromley Mercenary Hauler (CJ-875). The Bromley may have ten staterooms to the Malforge’s three. 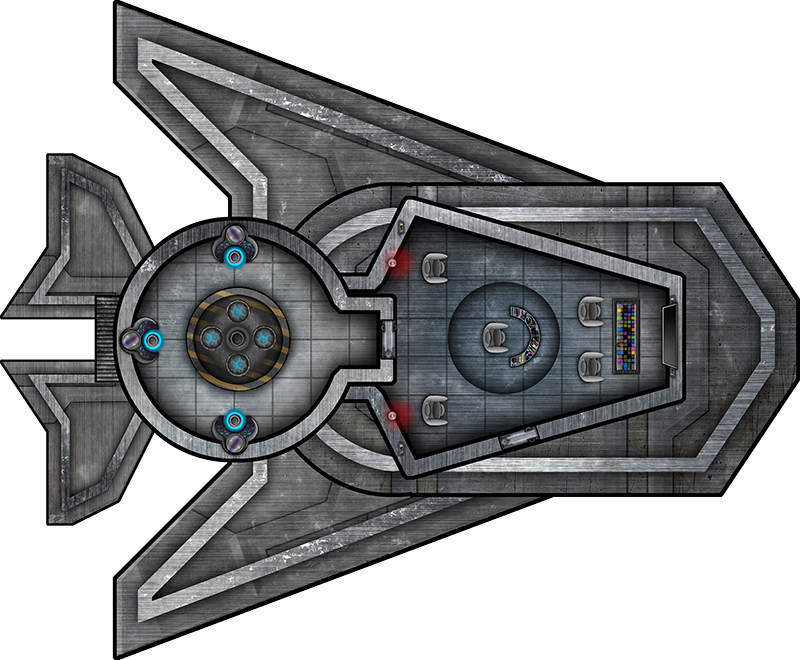 The Malforge Defense Craft may have a single turret sporting three beam lasers, the CJ-875 features six turrets, each with a pair of armor piercing pulse lasers, owing to the fact that the latter is six times the size of the Malforge ship. That difference in size gives it room to have a 263 ton cargo hold, giving the Bromley the ability to carry vehicles and transport precious cargo. However, the Bromley requires eleven people to be fully operational while the Malforge only requires three, and that is before the Malforge craft’s virtual crew software handles a position. Plus the Bromley costs more than four times the price of the Malforge. So what does choosing the MDC-41 Malforge Defense Craft say about someone that chooses it over the Bromley? Crews flying the Malforge have a smaller crew, more economical crew and can handle more personal stories. Alternatively crews that fly the Bromley are going to be taking on groups of guerilla rebels and pirate outfits. These three ships described here are featured in the Foreven Worlds: Ships of the Border Worlds. Download this awesome book today exclusively at DriveThruRPG and RPGNow. Hey Traveller Fans. I know we have been busy with Pathfinder and Fifth Edition lately. I want to reassure you that we have not forgotten about our favorite science fiction RPG. Have no fear; we have been hard at work on several supplements for Traveller. We have the third adventure for the Prelude to War Adventure Path coming up. Plus we are working on several ships. Today I would like to share with you one of those ships. This one is from the People’s Militia of Malforge. In the same way that we are designing all of our Cornathian Empire ships to be efficient, we’re creating all our Malforge ships to be … well not so efficient. Specifically, their technology just isn’t as good as those produced by others, even at the tech level. Its like buying a Yugo back in the 80’s; their technology just can’t compete. But to price conscious ship captains, this ship may look rather attractive, especially in the Foreven Worlds where the high technology of the Imperium and Zhodani Consulate is rarely produced but must be imported. This ships requires a 3 person crew and when the Virtual Crew software is engaged, even fewer personnel need to be on board. So it is quite possible to use this ship when playing a one-one-one game. Find more Jon Brazer Enterprises‘ Traveller books at DriveThruRPG and RPGNow.